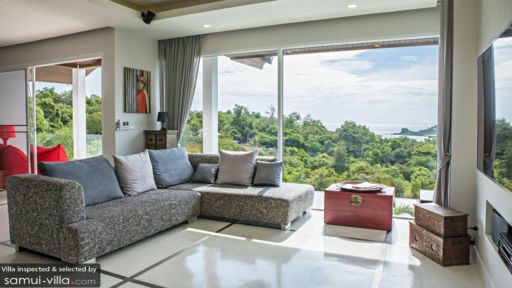 Offering sweeping views across Choeng Mon bay and even Koh Fan Noi, Samui, Sea Me Villa is a multi-level holiday home that inspires true tropical living while being immersed in best the island has to offer. The three-bedroom property features lavish interiors accented by the natural light streaming in from all sides. The turquoise water of the swimming pool overlooks the most luscious display of tropical flora to ensure you have a refreshing time while relaxing outdoors. 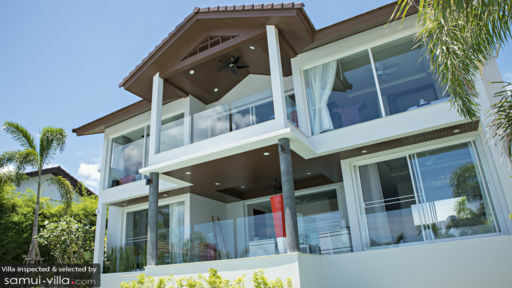 The bedrooms and the living spaces are elevated thus, they provide you with unmatched views of the shores. The three bedrooms at Sea Me Villa are designed to incorporate an indoor/outdoor living style with either an adjoined terrace as with the master bedroom of floor-to-ceiling glass windows overlooking the resplendent tropical landscape. The bedrooms are furnished with king-sized beds and one of them with twin beds that can be joined as one king-sized bed upon request. Pleasant interiors and jewel-toned accents make the bedrooms elegant and opulent at the same time. Otherwise minimally decorated and simply furnished, the bedrooms are spacious and air-conditioned. There are ensuite bathrooms with a master bathtub and the other two with walk-in showers as well as toiletries and bathrobes in place. Framed by lush tropical plants, the swimming pool with its crystal-clear water is as refreshing as you would expect and makes a great way for you to relax and feel rejuvenated. The fresh ambiance is perfect with evening cocktails on the terrace that is furnished with comfortable rattan sofas and chairs. The garden is well-kept and guests can enjoy a morning yoga session against a glorious backdrop. The poolside sala houses a relaxed sitting area for breakfast or drinks. Sea Me Villa has been designed with contemporary interiors speckled with designer accents such as clear, red lamps, modern cabinets polished in a bright vermillion and beautiful, hand-selected artwork. 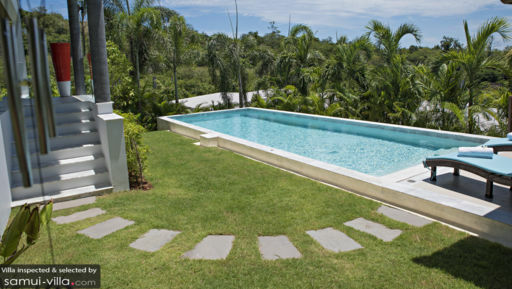 Towards the back of the villa or the opposite side to the swimming pool, you have another terrace adjoined to the main living pavilion that houses vermillion bean bags overlooking the sweeping landscape of Samui. The living area itself has been furnished with a comfortable sectional and traditional pieces for the perfect blend of new and old. To keep you entertained, there are modern conveniences like a wall-mounted flat-screen TV along with surround sound and a DVD player. A contemporary dining area with ghost chairs and a glass-top dining table stands behind the sitting area also focussing on the beautiful surrounding views. You can play your favourite music and enjoy the surround sound speakers while relishing a glass of house selection wine from the wine cooler. The modern kitchen is well-equipped state of the art appliances like an in-built microwave/oven, Samsung refrigerator with ice dispenser on the door and an induction cooktop to name a few. Fully-serviced with a team of motivated staff who will cater to all your needs and requirements. The staff looks after the upkeep and maintenance of the villa including 24-hour security so you can rest assured about your safety. Guests of the villa are free to avail the fitness facilities offered by Horizon Estate. There are many other services that are made available only upon request such as massages, airport transfers, car rentals and a BBQ in the garden. Within walking distance of Choeng Mon beach, Sea Me Villa is the quintessential holiday villa offering easy access to the beautiful places in Samui. There is Thong Son Bay beach where guests can have the hidden beach to themselves for relaxing and you can even go snorkelling. Restaurants, cafes and bars are plenty in the area and near Chaweng beach with places like Happy Elephant, [email protected], Secret Garden and Q Bar.